Well, I followed dear Paul’s suggestion (see his comment on my June 28 post) about getting in touch with a butterfly expert to let the world know about my, er, most exceptional sighting. Yesterday I wrote a message to a U.S. university professor…no names, of course…who was kind enough to inform me that my butterfly was “probably” (now I can safely say: “undoubtedly”!) NOT the zebra swallowtail butterfly but rather a European butterfly known as the “scarce swallowtail butterfly,” also called the “sail swallowtail” or “pear-tree swallowtail.” The expert professor, to whom I owe a huge debt of gratitude, sent me the following link: http://tinyurl.com/mecbbg Yes, that is my butterfly, no question. Latin name: Iphiclides podalirius. In fact, in Italian this butterfly is familiarly named podalirio, see: http://tinyurl.com/lnkxpt (incidentally, I was much amused that in French my butterfly is called “flambé“!). Yesterday, while hanging out the laundry (by the way, about 20 minutes later, we had a terrific downpour…eh, this happens to me all the time; in fact, if your neighbourhood/town/country is going through a drought, just invite me over to do some laundry…it will rain immediately, and the crops will be saved…), I dropped an item on the lower terrace, which is adjacent to our back garden. 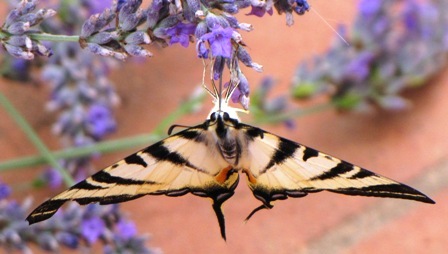 As I was going down the terrace stairs to retrieve it, I saw a rather large something fluttering about our enormous lavender plant. I took a closer look… and there was the most extraordinary butterfly I have ever seen, certainly in Italy. I dashed inside to grab my camera and spent the next 15-20 minutes (or more) alternately taking photographs and standing still to admire this gorgeous insect. But get this: according to various butterfly websites, my little friend lives exclusively in Northern America, mostly in the eastern United States, north-east Mexico and south-east Canada. I found no mention of sightings anywhere in Europe… So how did this marvellous critter land in my garden? 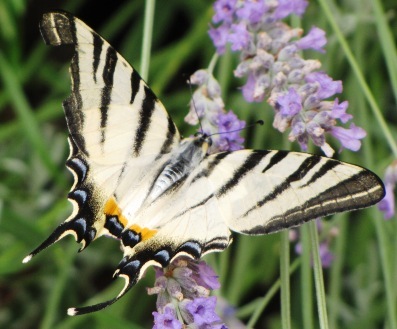 Is this the ONLY sighting of the zebra swallowtail butterfly in all of Europe? My friend had a slight injury to her left wing but otherwise seemed fine. 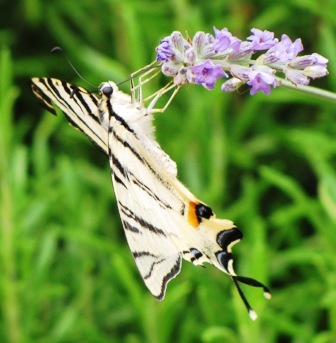 She certainly drank an enormous amount of nectar from my lavender blooms, using her proboscis, or long flexible tongue (see photos). After taking about a million photographs, I went to call Stefano and my parents. Stefano arrived with his super duper camera and took several photos, too. When it began raining, though, we had to go back into the house. Just as a reminder, NK cells are important immune system cells whose activity is reduced in multiple myeloma…in fact, this reduction is associated with advanced stages of this cancer as well as increased LDH and B2M. And studies have shown that myeloma patients with higher NK cell activity survive longer than those with lower activity. This article discusses two independent double-blind intervention studies—Study I and Study II. Study I included 32 (generally) healthy people between the ages of 55 and 65, selected because of their low NK cell activity and a history of recurrent coughs and colds. Study II: 110 individuals, same age group, also with low NK cell activity. In both studies, roughly half the participants drank the herbal tea mix while the rest, the placebo groups, drank unfortified regular tea. All study participants had to drink three cups of tea/day for at least two months (Study II lasted longer). Compared to the placebo groups, the herbal fortified tea groups showed much more NK cell activity. This is what we know from the abstract. Now for the full study, which is filled with, IMO, fascinating details. The introduction provides us with a general description of NK cells: Natural killer (NK) cells are pivotal in the early innate immune responses against pathogens. […] In addition to their role in tumor cell killing, NK cells are important effectors against certain viruses, parasites and bacteria infected cells. People with diminished NK cell activity suffer from repeated viral and/or bacterial infections. Back to the study now. Tea (both black and green) also apparently enhances NK cell activity. And, in fact, the tea given in the study was black tea fortified with extracts of the above-mentioned five herbs. The placebo groups also received black tea–unfortified, of course. In Study I, after one month, NK cell activity increased a bit, but not significantly, in both groups…but after two months, there was a 60 % increase in the fortified herbal tea group. Remarkable. In Study II, after two months, the fortified herbal tea group had a 4.2 increase in NK cell activity compared to the placebo group that registered only a 2.9 increase. In the Discussion part we have a description of the various effects of each herbal component of the fortified tea. All of the herbs are immunostimulatory (with the possible exception of cardamom). The study concludes that drinking the herbal fortified tea enhances NK cell activity compared with the consumption of regular tea. So this might be a good way to enhance immune status in subjects with a suboptimal immune function and recurrent episodes of colds and influenza. By the way, the total amount of the five herbs contained in the fortified tea was 4.5%. Not much, when you think about it…yet it was enough to raise NK cell activity. Remarkable. Note: this study made me wonder if a NK cell-enhancing treatment has been considered for, or even tested on, myeloma patients…unfortunately, I don’t have the time to check on that right now…oh well! My cousin (grazieeee!) sent me the link to a video that simply oozes with cuteness! 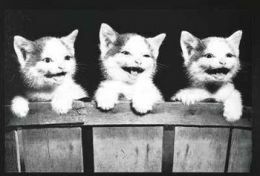 Especially for cat lovers: http://tinyurl.com/mdoqgy Irrestistible! A blog reader (thanks!) sent me the link (see below) to this Phase II study listed on the Clinical Trials website. The main purpose of the study is to determine if the Omega 3 supplementation will help prevent or delay progression of the disease to a stage that requires treatment. Well, that sounds good to me, especially since my regular regimen includes 4 grams of fish oil/day, which is slightly more than what these patients take in the first month before building to higher doses (the highest dose will be 11 grams and 250 mg/day). …from which I will take a few excerpts, such as the following: Although the cause of MGUS and multiple myeloma remain [sic] largely unclear, previous cohort and case-control studies have reported an elevated risk of multiple myeloma among farmers and other agricultural workers. More specifically, pesticides (ie, insecticides, herbicides, fungicides) have been hypothesized as the basis for these associations. However, most prior investigations have been hampered by small numbers and limited exposure assessment. The Agricultural Health Study of 57,310 private and commercial licensed applicators of restricted use of pesticides enabled researchers to determine that there was a 1.34-fold […] excess risk of multiple myeloma among pesticide applicators compared with population rates in Iowa and North Carolina. But let’s keep reading. The team of researchers used the Agricultural Health Study to carry out (my emphasis) the first population-based study of MGUS in relation to pesticide exposure in a sample of 678 male pesticide applicators. They discovered that 38 (5.6%) of these workers had MGUS. But read this: nobody under the age of 50 had MGUS…that adds up to a total of 123/678 men. So MGUS was detected only in the older-than-50 group. The team also looked at 50 (!) specific pesticides, of which the worst, in terms of being MGUS risk factors, were: the chlorinated insecticide dieldrin, the fumigant mixture carbon-tetrachloride/carbon disulfide, and the fungicide chlorthalonil. Further on: Our analyses point to possible links with dieldrin, a chlorinated insecticide, which had a significant 5-fold excess risk of MGUS prevalence, and carbon tetrachloride/carbon disulfide mix, a fumigant, which had a significant 4-fold risk of MGUS prevalence. Holy cat! Other potentially dangerous substances are also mentioned…such as Permethrin, a commonly used insecticide that has been linked to multiple myeloma, another insecticide called chlorpyrifos, and two herbicides—atrazine and glyphosate. The researchers conclude that (again, my emphasis) several million Americans use pesticides for which we have found an association with MGUS in the Agricultural Health Study. Some of these same chemicals have been associated with excess multiple myeloma risk. […] Future studies are needed to improve our knowledge on the role of pesticide exposure in the pathogenesis of MGUS, as well as the potential role in progression from MGUS to multiple myeloma. I am almost 100% positive that this is the first study to link MGUS to exposure to commonly used insecticides, herbicides and so on. This bit of news is rather unsettling, to say the least. By the way, if you use any toxic stuff in your garden and would like to have a look at the Table listing the various substances tested (more than 30), drop me a note. After reading this study, I am sooo glad that our garden is completely organic. Sure, we are bothered by weeds, but we don’t use herbicides; we simply do a bit of weeding whenever possible. Weeds are annoying but they can’t kill us. And yes, our garden has been invaded by pests of all sorts, from tiny aphids to big snails, but we have never used insecticides to get rid of them. We either use nothing at all, or, when things get really bad, I make up a spray bottle with natural homemade mixes. True, this way we lose a certain number of raspberries and figs and whatnot, but so be it. I would rather be safe than poisoned! I do have a confession, though: every spring for the past few years, I have periodically used a Bayer ant spray to keep ants from marching through our house…it releases a sort of smelly foamy poison (I am now too scared to check the active ingredient…!) that is supposed to create an anti-ant barrier for three months. Now, since I have used that insecticide only in recent years, I know it didn’t cause my (former) MGUS. Even so, I am now seriously thinking of taking up Cathy’s suggestion to use corn meal instead! I also just did a quick online search and found heaps of helpful suggestions on natural non-toxic ways to keep ants from becoming too bothersome. I am going to try a few of those…and from this day forward, there will be no more toxic poisons in or around my house! I haven’t had very much time to do research these past few days, but I did want to post the link to an article about two recent laughter studies, see: http://tinyurl.com/lye6gw I have already posted about the importance of avoiding stress (because of the connection between stress and myeloma cell proliferation)…but these studies give us a few more good reasons to laugh laugh laugh and…laugh! This bit, toward the end, caught my attention…not because of the rather poor phrasing (hehe) but for the content: Resveratrol is largely inactivated by the gut or liver before it reaches the blood stream, where it exerts its effects – whatever they may be – good, bad, or indifferent. Thus, most of the reseveratrol [sic] in imbibed red wine does not reach the circulation. Interestingly, absorption via the mucous membanes [sic] in the mouth can result in up to around 100 times the blood levels, if done slowly rather than simply gulping it down. She began filling in the blanks: “I come to the school…” Then she paused, peeking up at me. My slight frown indicated that “the” was not the correct answer. So she said “no, I come to a school…,” and again glanced at me. Another frown.